Washington’s farewell address inspired presidents from Ike to Obama. Read the introduction to Daily Beast Editor in Chief John Avlon’s new book. This is the story of the most famous American speech you’ve never read. Once celebrated as civic scripture, more widely reprinted than the Declaration of Independence, George Washington’s Farewell Address is now almost forgotten. Our first founding father intended it to be his last political will and testament—the sum of his hard-won wisdom from a half-century of public service in war and peace. Most political speeches are full of promises, New Deals, and New Covenants. Washington’s Farewell was “a warning from a parting friend,” written for future generations of Americans about the forces he feared could destroy our democratic republic. Chief among these were hyper-partisanship, excessive debt, and foreign wars—dangers we still struggle with today. Washington also used his Farewell Address to proclaim first principles that could offer enduring solutions: the pursuit of peace through strength, the wisdom of moderation, and the importance of private virtue and public education to a self-governing people, as he established the precedent of a peaceful transfer of power. When he announced his retirement in 1796 after two bruising terms as president, the success of the American experiment was far from certain. Just twenty years after the Declaration of Independence and less than a decade since the Constitution’s adoption, the country was erupting into opposing factions, even within Washington’s cabinet. Civil war seemed to be a real possibility. The Articles of Confederation had been too weak to sustain the nation in the years after independence, requiring the triage of a closed-door Constitutional Convention and the election of Washington as the first president. There was no guarantee this incarnation of the republic would survive. Through force of will and a gritty commitment to the governing principle of moderation, Washington kept these forces at bay while our infant independent nation gained enough strength to stand on its own. At age sixty-four, he still stood a head taller than most men, but his health was beginning to fail, sparking gossip among rivals that Washington was “growing old, his bodily health less firm, his memory always bad, becoming worse.” He was always an uncomfortable public speaker, low-voiced and halting, and his lack of oratorical confidence was at least in part a function of physical discomfort. He was down to a single tooth, with set of dentures hanging around a lonely left bicuspid. His artificial teeth were state-of-the-art for the time, but the man had a menagerie in his mouth: teeth carved from walrus tusks and hippopotamus bone (then sonorously known as a “sea horse”) as well as the repurposed teeth of nine slaves. This required a clenched jaw and a minimum of smiles. His sense of personal urgency was compounded by events. Storm clouds threatened our snug harbors on the Atlantic. Revolutions everywhere seemed to be devolving toward anarchy and terror, the guillotine and the mass execution. Washington understood that utopian dreams often turn into nightmares. The implosion of democratic republics overseas sent shock waves: the idealism of the French Revolution turned to tyranny; Poland’s attempt at a parliamentary democracy with an elected monarch was polarized and paralyzed; St. Domingue’s Caribbean slave rebellion was equal parts liberation and slaughter. The founding fathers’ fascination—obsession is not too strong a word—with ancient Greece and Rome offered cautionary tales, warning about the forces that brought down past republics. Edward Gibbon’s The History of the Decline and Fall of the Roman Empire was a contemporary bestseller, sold in bookstores from Boston to Charleston, and was one of the most popular books in the congressional library. Washington’s vice president, John Adams, believed “there never was a democracy yet that did not commit suicide.” Civilization was understood to be fragile, barbarians always at the gate. George Washington had set his mind on a Farewell Address at the end of his first term. He assembled the greatest team of ghostwriters in history to help flesh out his ideas. First James Madison and then Alexander Hamilton—the once-friendly coauthors of the Federalist Papers—were summoned to work on the speech in secret, even as both schemed to create opposing political parties, against Washington’s wishes and in contradiction of the warning they helped him write. In bringing their words together, Washington hoped to create a document beyond partisanship, able to unite the nation. To Washington, the success of a nation, like the success of an individual, was a matter of independence, integrity, and industry. The character of a nation mattered as much as the character of a man or woman. His Farewell Address represented lessons taken from his time as a surveyor, soldier, farmer, revolutionary general, entrepreneur, and president, drawing on sources as diverse as the Bible, the Constitution, and his favorite play, Cato. It was the work of a lifetime, an autobiography of ideas. Washington’s Farewell Address was not read aloud by its author before an audience. Instead of formally addressing legislative leaders as a European king, he delivered the news in an open letter written directly to the American people through one of the 100 newspapers in the nation. He chose the independent-minded American Daily Advertiser, whose offices were five blocks down the street from the executive mansion in Philadelphia. He submitted it almost nine years to the day after the Constitution was signed. Addressed to his “friends and fellow citizens,” the news of Washington’s decision not to run for a third term, establishing the two-term tradition, was unceremoniously bunched between advertisements for slaves, rum, and tobacco. There are founding fathers who are famous for their writing. Washington is not one of them. Jefferson had the heroic rhythm and flow of the Declaration. Adams could be acerbic, puffed up, pretentious, and funny. Hamilton was a live wire of insights and attitude. Madison was all about ideas, philosophy in form and function. Washington took a soldier’s approach to his correspondence, direct and mission driven. He declared “with me it has always been a maxim rather to let my designs appear from my works than by my expressions.” He was nonetheless prolific with his pen, cutting the quills himself and writing in his neat, rightward-leaning script. 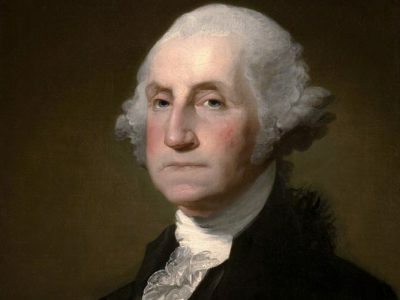 Washington was modest but not without a sense of his place in history. He kept his papers carefully organized at Mount Vernon—totaling more than 100,000 letters, manuscripts, drafts, and diaries—so mindful of history’s eyes that he reached back to edit some of his early letters during his retirement. He knew posterity was watching, considering his papers “a species of public property, sacred in my hands.” And the Farewell Address was his greatest work. It did not emerge in single moment of inspiration. The Farewell Address’s essential insights can be found in Washington’s previous farewell to the nation, when he resigned his commission as general of the Continental Army in 1783, while offering parting advice for the nation he saw poised between greatness and great danger. The maxims that guided him through the Revolutionary War remained his bedrock throughout the presidency: a strong central government led by an independent chief executive, the transformative power but self-interested limits of private businesses, and the importance of religion and morality in building the character of the country. At his death in December 1799, two weeks before the end of the century, Washington completed his Farewell Address with a personal coda—a written will that announced his intention to free his slaves—finally confronting, inartfully and incompletely, the core contradiction of slavery. As the nation mourned, a new struggle began over the afterlife of Washington’s ideas. From the torching of the White House in the War of 1812 to the fraying ties between North and South, the Farewell Address helped reconcile competing factions for generations. Supreme Court chief justice John Marshall regarded Washington’s Farewell as a source of “precepts to which the American statesmen cannot too frequently recur.” Washington’s sometime friend and frequent rival Thomas Jefferson, who devoted so much subterranean energy to attacking his presidential policies, nonetheless directed the newly formed University of Virginia to assign the Farewell Address to all law school students as one of “the best guides” to “the distinctive principles of the government . . . of the United States.” The Monroe Doctrine codified its advice in foreign affairs. A generation later, President Andrew Jackson devoted his own Farewell Address to a meditation on the enduring virtues of Washington’s Farewell and its warnings against secession. As the Civil War approached, both North and South used the Farewell Address as a rhetorical weapon, the ultimate patriotic primary source. Advocates for Union, such as Henry Clay and Daniel Webster, cited the speech under the Capitol dome, warning southern colleagues not to give in to the temptation of secession, lest they violate Washington’s Farewell advice. Abraham Lincoln repeatedly referred to it in his 1860 campaign stump speech. Jefferson Davis, the future president of the Confederacy, tried to twist Washington into a partisan figure, refusing to pay for drafts of the Farewell Address to be enshrined in the Library of Congress at taxpayer expense, cloaking the snub in arguments for fiscal discipline. He and other Confederates claimed Washington as one of their own, a slave-owning southern rebel. In the wake of the Civil War, the Farewell Address was quoted to bind the wounds between the states through the power of public education. It became required reading, a benign form of civic indoctrination, taught in schools and recited in public squares on the occasion of Washington’s birthday. But in the wake of the First World War, the Farewell Address began to fall out of favor. Two Washington scholars—President Woodrow Wilson and Senator Henry Cabot Lodge—squared off on whether the United States should enter the League of Nations, debating the meaning and applicability of the Farewell. The Farewell was eclipsed by the Gettysburg Address as America’s go-to civic scripture. Lincoln’s speech is approachable: a rhythmic, flowing 272 words, rather than 6,000 words at a steep incline. Which would you rather memorize? It was the New Testament to Washington’s Old Testament, a poetic promise of life after death, rather than rules of behavior dispatched by a distant god. Washington’s insistence on self-mastery can make him seem cold and unapproachable. His birthday, once celebrated as “America’s Political Christmas,” is now distinguished primarily by a winter long weekend, bundled up with other presidents. Few films dramatize his life, even as popular attention is lavished upon his surrogate sons of the revolution. But behind the dutiful portraits that show a dour face dotted with impassive eyes was a passionate, ambitious man who worked tirelessly to achieve independence for his country and himself. The Farewell Address is still read aloud each year in the U.S. Senate, the honor alternating between Democrats and Republicans, intended to serve as a reminder of the obligations Washington imposed on his inheritors—a tribute given to no other speech in our nation. It has inspired other presidents, most famously Dwight D. Eisenhower, to encapsulate their own farsighted farewell warnings about the existential threats facing our republic. But the only contemporary hardcover edition of the Farewell Address currently in print misstates the date of publication—it’s labeled September 17 rather than 19—and declares that the speech was “delivered to the assembled members of Congress.” The Farewell’s most famous dictum—no entangling alliances—never actually appears in the address, while its core warning against hyperpartisanship has been ignored. Basic details have been lost alongside its central place in the civic debates of our nation. Now, in the early decades of the twenty-first century, there is renewed anxiety about America’s future, a tendency to view our nation in decline as other empires rise overseas. The same anxiety might drive us to reflect on first principles and there is no better primary source than our first president’s lessons for future generations. The durable wisdom of the Farewell Address deserves greater appreciation and it is just beginning to receive wider recognition. In recent years it has been cited by The Daily Show on election night and inspired a song in the hip-hop musical Hamilton. Washington’s influence endures in a political philosophy of independence. It is based on a belief in a strong and inclusive government, led by an independent executive, pursuing military and economic strength to avoid a dangerous dependence on foreign nations. Washingtonians believe in the governing principle of moderation, balancing idealism with realism, rejecting overextension and separatism from whatever source. They strive to find a wise balance between individual liberty and generational responsibility. Today, we need only take the Farewell Address down from the shelf and dust it off to make this old story new again, connecting the past and present with the future. It can still achieve Washington’s aim by helping us to reunite our nation and re-center our politics. It can teach the lessons rooted in Washington’s life. From Washington’s Farewell: the Founding Father’s Warning to Future Generations by John Avlon. Copyright © 2017 by John Avlon. Reprinted by permission of Simon & Schuster, Inc. All rights reserved. This entry was posted in Columns, Featured Columns and tagged The Daily Beast, Washington's Farewell. Bookmark the permalink.